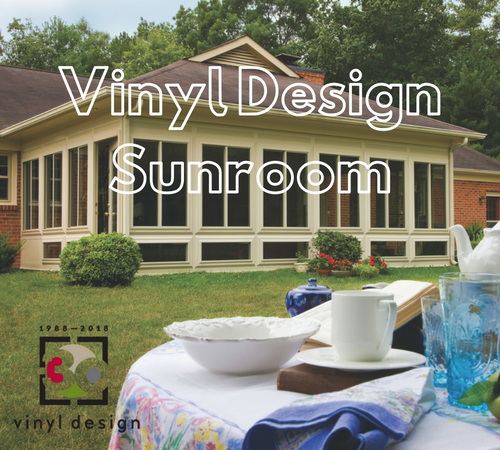 With summer upon us, there has never been a better time to invest in a Vinyl Design sunroom. After all, sunrooms give your home additional living space that can be used for a variety of functions. They also provide an extra aesthetic touch. Vinyl Design sunrooms, in particular, offer even more benefits, especially when compared to their more traditional aluminum counterparts. If you are considering a sunroom addition, here are just a few of the top advantages associated with vinyl sunrooms. Unlike aluminum, which requires regular touch-ups, vinyl sunrooms are resistant to scratches and dents, meaning they’ll never need to be painted. At the same time, vinyl does not crack, fade, oxidize, or rot. This ensures your new sunroom maintains its like new appearance well into the future. Even in areas known for sand and spray, vinyl will not corrode or rust. Typically, vinyl sunrooms only require cleaning, which is easy to do using a garden hose, mild soap, and a soft bristle brush for the toughest dirt. Although aluminum sunroom manufacturers try to make their products as energy efficient as possible, they just can’t stand up to vinyl. Aluminum is notorious for providing ineffective insulation, allowing for excessive heat transfer in and out of your new sunroom. Not only is this bad for the environment, it is also bad for your wallet. It will cost more to cool your aluminum sunroom in the summer and heat it in the winter. On the other hand, vinyl sunrooms are designed to be easily heated and cooled, making them ideal for year-round use. Aluminum rooms often use inefficient windows. You wouldn’t use metal windows in your home, so why would you build a sunroom with them. Vinyl Design sunrooms use high-quality vinyl windows. The windows are equal to or better than most replacement windows. You can be confident your room will be comfortable year round. Aluminum sunrooms utilize exposed screws. Those screws create an unsightly appearance on your room. Over time those screws can rust and stain the exterior of the room. Vinyl Design sunrooms utilize a unique hidden fastener system. Your new room will have a clean look on the first day and every day after that. Vinyl Design rooms are custom built. The windows and wall structures are built to the exact size needed. Fill panels are not needed. The result is you get more view with a VInyl Design room. Vinyl Design sunrooms have minimal maintenance requirements, reduced upkeep costs, excellent insulation and superior durability. They are custom made for your home to maximize your view. It is easy to see why more and more homeowners are choosing to have a Vinyl Design sunroom added on to their home. This gives them a beautiful space to enjoy the outdoors without being exposed to the elements or pesky insects.